Nigeria is a heterogeneous society with various distinct ethnicities, religions, and languages represented in the population. As a precondition to an integrative process of nationhood, political ideologies and economic interests often retreat along and into traditional or revised ethnic loyalties. The Owegbe cult is a case in point. Traditionally, Owegbe is a fortifying ritual that offers spiritual armor against physical harm. But it is also a socially transformative group enterprise that inducted entrants into a powerful organization to serve collective political ends. 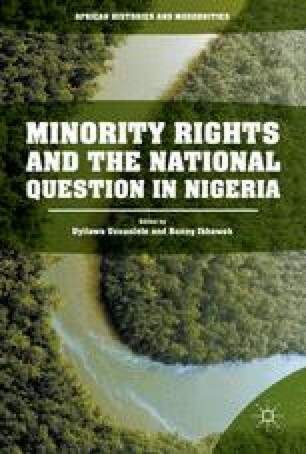 Documents from the courts and the Alexander Commission suggest that Owegbe’s social, political, and ethnic functions emerged in the volatile atmosphere of Nigeria’s Midwest State Movement in the 1950s and 1960s. This chapter uses the ethnic theories of the time, government reports, and popular press accounts to examine Owegbe as a secret society in a contentious regional environment. Owegbe served economic aspirations in a region once dominated by a dynastic political kingship system that, by the 1960s, included increasingly sophisticated and educated entrepreneurial and political elites; Yoruba, Igbo, and Edo national interests; as well as the patrimonial interests of the palace. Recently, Owegbe has functioned as a university student secret society.